Ask An Expert: Help Me, I’m Stressed! – Sooo Fabulous! 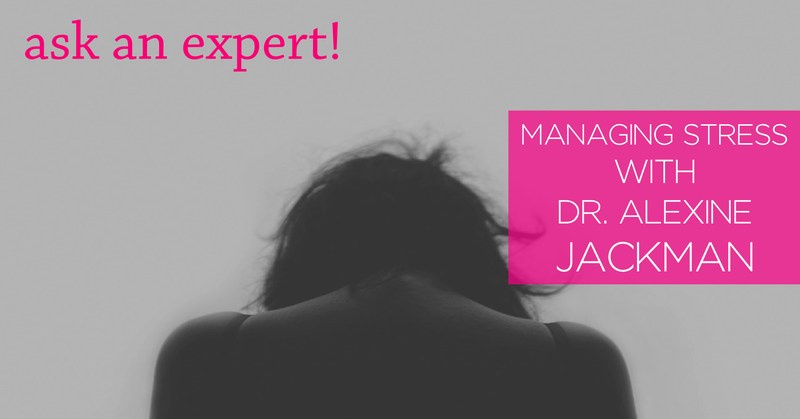 Ask An Expert: Help Me, I’m Stressed! Lately, way too many of my conversations with friends and family have been about stress: the job, the out-of-control boss, the new baby, the no-good boyfriend, bills, school, and the pressure to make it. It made me get to thinking about what we’re doing wrong: why aren’t we coping and conquering? So I reached out to Dr. Alexine Jackman for some answers. She’s a young, hip certified consultant, whose job is to help people manage stress. Our conversation was an absolute eye-opener. Alexine, give me the skinny on stress. What is it, really? Stress is a physical reaction to a perceived threat. It is meant to be a survival mechanism. If you were attacked walking home one night, you would automatically go into the stress response, also known as the fight or flight response. Adrenaline and cortisol would increase muscle tension, blood pressure, pulse rate, breathing rate and blood sugar. That response would help you run away or fight back. Your body responds to all perceived threats in this way. So imagine sitting at your desk worrying about whether you’ll meet a deadline or make the bills at the end of the month; your body responds to those threats in the same way it would respond to a physical attack. The difference is, fighting the boss or fleeing from the bill collector isn’t helpful (but if you’ve ever felt like you wanted to, now you know why)! So interesting! I read somewhere that people between 18 and 33 are the most stressed generation of all time. Why? I think technology is a major influence. It’s wonderful but has a downside. We’re more connected and everything we want to know is a click away, but as a result we’re in information overload. Our brains are working 24/7. Add to that the mental pressure of the ideal images we’re constantly exposed to. You could spend all day looking at perfect celebrities, scrolling through meticulously edited Facebook and Instagram pictures, and reading tweets about the incredible things other people are doing. If you use these polished snippets of other people’s lives as a benchmark for yours, it can result in a huge feeling of pressure to perform, to be put together, to “make it”. The ironic effect is that internalized pressure and the stress that comes with it is often the thing that sabotages our efforts to achieve our goals. Yikes! Did someone say, “digital detox?” What are some other sources of stress? There’s also the increase in processed foods, the epidemic of sleep deprivation and a general lack of physical activity. Put it all together and you have fertile ground for chronic stress. OK. So I have to ask. What’s love got to do with it? It seems like finding (and keeping) a life partner could be an incredibly stressful thing. I think it depends on how you approach it. Positive social interaction, in general, is necessary for good health, not just within a romantic relationship. So it’s important not to place your entire focus there while neglecting other avenues for healthy social ties. My best advice is to know yourself inside and out, what makes you tick, your personal development goals and how you make yourself happy. When you approach love from the view of wanting to share your awesomeness with someone else, as opposed to needing someone to make you feel awesome, it becomes much less stressful. The positive energy you put out will attract the kind of partner you deserve. What about money? In your line of work, have you seen a big connection between finances and stress? Financial stress is common and it’s quite a predicament because when you’re worried about finances, stress shuts down the thinking part of your brain making it harder to come up with the idea or plan you need to manage or boost your finances. Truthfully, some of the financial stress among younger persons doesn’t come from an absolute lack of money but rather the attachment to it and to a certain, sometimes unsustainable, lifestyle. When dealing with financial stress, set your financial goals and make a plan but it’s important to honestly make the distinction between absolute and relative need. That’s great advice. I’m also dying to know: How will I know if I am stressed? What are some of the signs? The list is alarmingly long! Some of the most common physical symptoms are headaches, insomnia, anxiety and panic attacks, high blood pressure, shortness of breath, racing heart, palpitations, acid reflux, memory loss, dizziness and frequent viral infections due to a weakened immune system. Wow. The list is long! And what about when I’m moody and tripping? It’s likely due to stress, right? Behavior wise, you may find yourself feeling irritable, angry, overwhelmed, sad, lost, withdrawn or depending on alcohol, food or smoking to improve your mood. Chronic stress increases your risk of depression and anxiety disorders so it’s important to pick up on changes in your behavior early. People claim exercise gives them an outlet for releasing stress. Does it really help? Exercise is a fantastic stress reliever. It reduces the symptoms and risk of depression and anxiety. It helps lift your mood and helps with pain control through the release of endorphins. It relieves stress by using up circulating adrenaline. I’m sure you’d rather take out that fight response on a kickboxing class than an unsuspecting work colleague or friend so by all and any means, keep moving! So exercise, and what else? Get your sleep! The car doesn’t run if you don’t put gas in it, right? Sleep is your body’s chance to refuel and repair each night. If your body doesn’t get sleep, it doesn’t run properly. Breathe, literally. Deep breathing, meditation, mindfulness and a host of other relaxation techniques can counteract stress. They’re easy to learn and completely under your control. This means no matter how chaotic things and people are around you, you can create your own little oasis of calm. Laugh. Laughter feels good. The trick is to know what makes you laugh and to make it part of your routine instead of waiting for laughter to come to you. Make a plan. Sounds simple but you can spend the whole day worrying about something without actually answering the question, what’s my plan to deal with it? Your brain shuts down during stress, so take a pen and piece of paper and brainstorm for ideas, ask a mentor for advice, or turn to Google. These are all good ways to get your brain back online and figure out which things under your control you can change. Let it go. For the things that you can’t control, chalk it up to experience and keep moving. This isn’t easy and it takes tons of practice but everything you’re good at doing now probably fit that description at one point in time. Sounds great! But when will I find the time to actually do these things? One of the biggest saboteurs of managing stress is all-or-nothing thinking. It’s a common myth that if you can’t carve out a big chunk of time to relax, unwind, or partake in a favorite activity, then you can’t de-stress at all. If five or ten minutes to listen to soothing music, meditate, watch the sunset or call a friend who makes you laugh is all you have to spare, then use it. Schedule it into your day with the rest of your tasks! Dr. Alexine Jackman heads up The Stress Free Lifestyle Centre. She’s a Certified Stress Management Consultant and has a degree in Medicine and Surgery. On the job, she specializes in stress management consultations, job stress assessments and workshops, educational talks, and relaxation skills training. To de-stress, Alexine starts her day with a few minutes of meditation, stays committed to fitness, enjoys her favorite channels on YouTube, and gets in about seven to eight hours of sleep each night. Previous PostI’ve Been Drinking: Healthy Alternatives to SodaNext PostHoliday Gift Guide: Island Style! Nice of you to help your friends and family with such needed information. Reblogged this on This is my story. CGK-SIN-MEL.